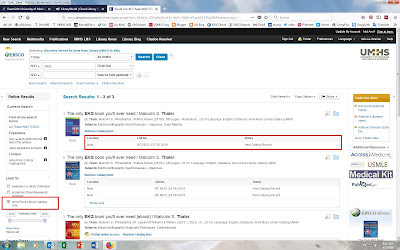 Now when you search for information resources using our 'one search' interface, the EBSCO Discovery Service (EDS), you will also be retrieving the holdings records of the Anne Ross Library. 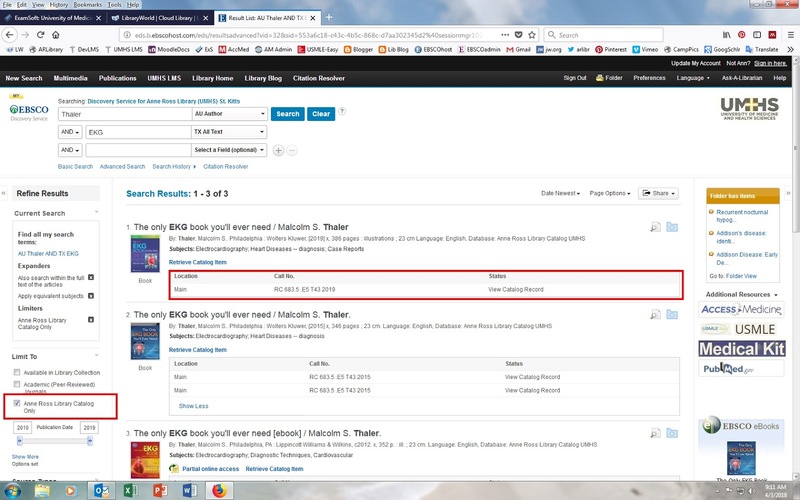 Our Library World OPAC (online public access catalogue) is now integrated into the EBSCO Discovery Service database to facilitate easier searching of the library's resources. 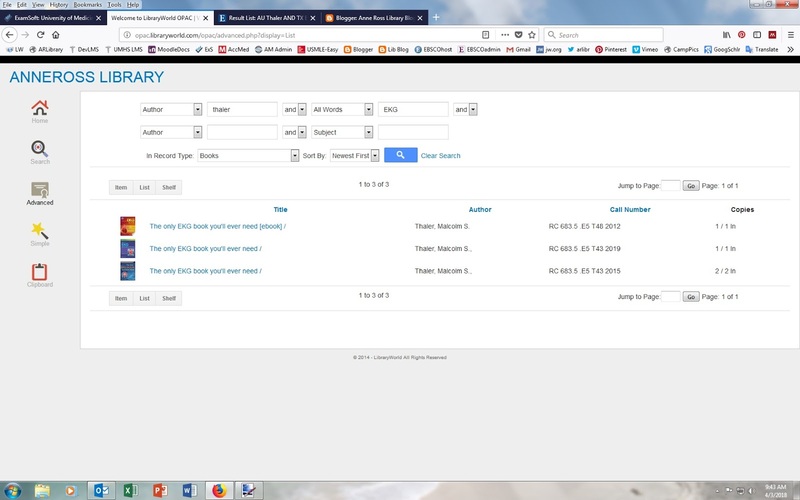 The Discover Search interface (EDS) is shown here highlighting the location of library holdings information. Links back to the LibraryWorld database are included. In the left side bar notice the location of the search 'limiter' to narrow your search to retrieve only items that are held in the library. View of these same materials as found in the Anne Ross Library Catalogue. 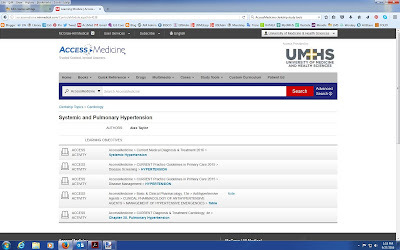 EDS also includes records for the resources held at UMHS Maine Campus. 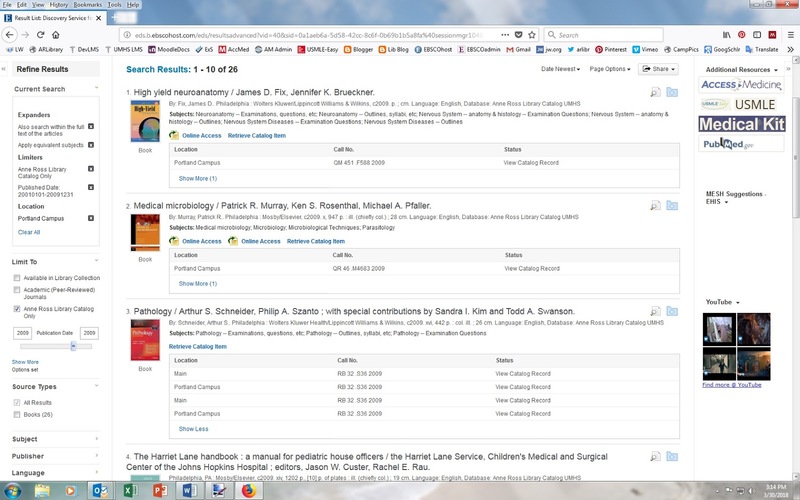 Links to our various eBook Collections and extensive downloadable ebook holdings are also retrievable through this same 'one search' interface. 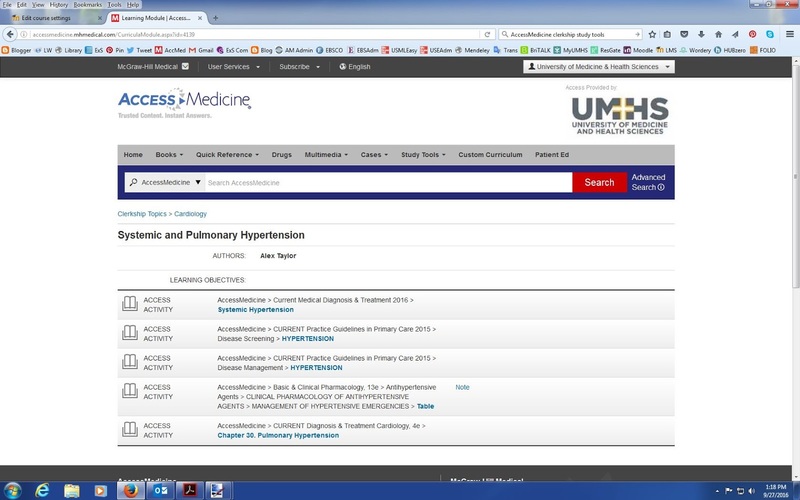 Three new video tutorials have been created to assist UMHS Faculty and Students with using the valuable AccessMedicine database. These are available for viewing by going to the Training Kit page on the Library website, and clicking the links provided under the 'Resource Guides' column. Please contact me if you need to be reminded of your login credentials for AccessMedicine. McGraw Hill, publishers of quality medical information resources, have added a new feature to their AccessMedicine product. Specifically designed for students on their clerkship rotations, the database has now opened up for all subscribers an internal medicine model curriculum along the lines of what was formerly made available to Instructors as part of the Custom Curriculum platform. This new 'Clerkship Topics' section is found under the 'Study Tools' tab. Each main subject area contains numerous modules with activities organized under key topics of importance to that field. This study tool helps focus the student's attention on the key aspects of each topic and provides targeted readings, cases and other activities to aid the learning process and mastery of the information. 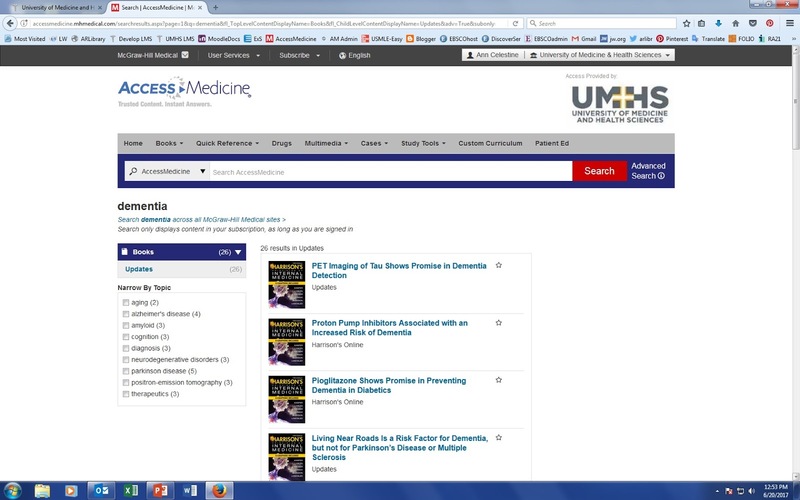 The link for AccessMedicine is provided in the left-side bar of the Library Home Page as well as the right-side bar of this Library Blog. Logins for UMHS students were emailed to each of you during your first semester. If you need further assistance with your login and/or navigating this valuable resource, please contact us at the UMHS Anne Ross Library. I also encourage you, while you are in the site, to take some time and check out further some of the other cool resources available to you in the AccessMedicine database. Join me on a tour of the Anne Ross Library where I will be showcasing the information resources provided by the university for the benefit of the UMHS student body and faculty. I hope you will find time to further explore and utilize these valuable databases, as you probably realize you can’t memorize it all! Once you are practicing medicine, the key to success will be your ability to search out the best and most current medical information when and where you need it. The foundation of evidence-based practice is being able to find, access and evaluate the medical evidence! The Anne Ross Library Home page is your jumping off point to all of the library's resources so we will start the tour there http://lib.umhs-sk.net. The online Anne Ross Library Catalogue is the first link in the left-hand side bar. Browse the library’s collection of books, videos, ebooks, etc. and place holds on the items you need that are checked out, or click the link provided in the record to go to the ebook itself. The LibraryWorld catalogue provides a mobile interface link or downloadable App for easy access to searching the library’s holdings. The mobile login for the catalogue is USER: AnneRoss Library (notice NO space between ‘Anne’ and ‘Ross’), and the PSW: (blank) – no password is required. Search for ‘ebook’ or ‘electronic resource’ along with your search term, to easily locate in the catalogue records available downloadable ebooks. The next link is to MyUMHS which is the UMHS Egnyte file server drive or online ‘M’ drive for remote access to all your course materials. If you can’t recall the login sent to you via email, contact the Library. Clicking on the links in the second grouping of the left sidebar and you can access the various EBSCO databases. Do you remember this login? In particular on this list of databases, take time to explore EBSCO’s DynaMed database,a topical, point-of-care clinical database. It will be invaluable to you in ICM and beyond. When you don’t have time to search the journal literature for the latest treatment options, DynaMed gathers this information for you and updates the database daily. To access DynaMed on your mobile device go into DynaMed and click on the ‘Mobile’ tab along the top of the screen for the latest step-by-step instructions. NOTE: Currently we are trialing the new DynaMed Plus database as well. This updated DynaMed platform has expanded and been enhanced in many ways. In fact, this produce has been adopted by the ACP (American College of Physicians) as their official clinical decision support tool. Make sure you explore it too! NOTE 2: UMHS is also currently trialing the GIDEON (Global Infectious Disease and Epidemiology Network) database from EBSCO which is a must for your Microbiology and Epidemiology classes with its extensive microbiology and data on global infectious diseases, and current disease outbreaks. 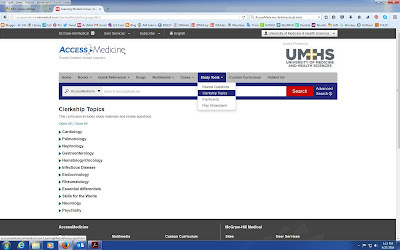 Next check out the EBSCO journal databases such as Academic Search Premier and Medline Complete. These databases provide you with access to around 6000 journals, approximately 2000 of which are medical journals with full text! This resource will be very useful to you for researching a medical topic and discovering the latest articles published on that topic. The advantage to these EBSCO journal databases over PubMed (or Google & Google Scholar for that matter) is the instant and comprehensive access to the full text for many of the articles. In fact full text is provided for 34% of the citations found in PubMed! You also have the option of performing your literature search in PubMed itself (using the special link you see on the Library Home page) and being provided the LinkOut notification (the UMHS logo will display in the top right corner whenever we have available the full text of an article retrieved by your PubMed search). In order for the LinkOut icon to appear you must also be signed into your personal MyNCBI account, which you can set up for yourself for free. 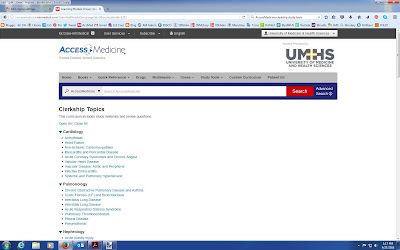 The EBSCO Academic and Clinical ebook collections (containing over 150,000 ebooks, 2000 of which are clinical ebooks) are also accessible using your UMHS EBSCO login. However, you will also need to set up for yourself your own personal MyEBSCO account. This personal second login will allow you to save your database searches, collect articles in folders, as well as download the ebooks. In addition an EBSCO ebook App is available for your mobile devices allowing you to search, check out, and download ebooks to your mobile reading device, tablet or phone. Returning to the Library Home page next please locate the link for Access Medicine. This valuable resource provides you with full text access to over 85 medical reference textbooks (including Harrison’s’! ), procedural and instructional videos, clinical cases, practice questions, a drug database, the Diagnosaurus diagnostic tool, etc. Course materials and small group project assignments from your professors may also be available to you via this platform. Your personal logins are set up and emailed to you soon after your coming to UMHS. If you have trouble accessing your personal space in this database, please contact the library. Med4 and EBS5 students MUST verify their personal logins before the end of their last St. Kitts semester in order to be able to access their course materials in Maine and during the Clinical Core Rotations! AccessMedicine also provides an App for your mobile. Set up instructions for your device is on the Anne Ross Library Blog. The App is designed as a diagnostic tool and contains four key diagnostic resources from McGraw Hill, but not the whole AccessMedicine database, or the Custom Curriculum. VERY IMPORTANT: In Maine all the course materials for your ICM 2 course will be assigned through learning modules in AccessMedicine. Also, when you go out on your Clinical Core Rotationsa whole curriculum of more than 150 learning modules will be assigned to you for your completion during that time. 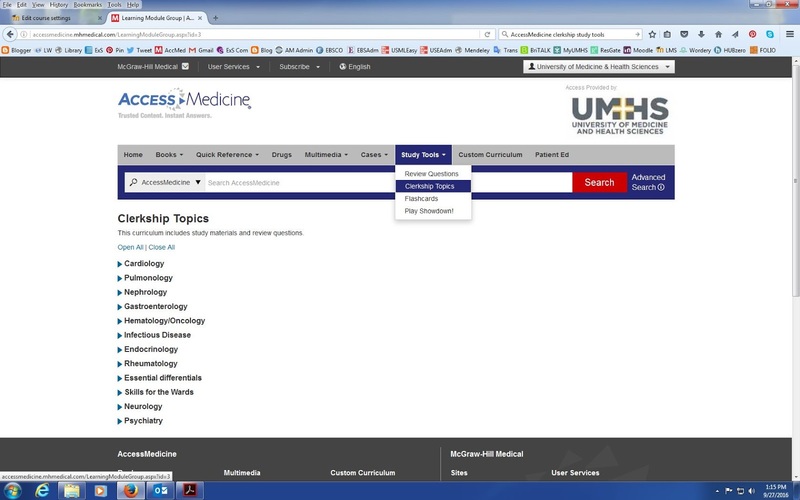 So it is very important that you are completely up to speed with using AccessMedicine, understanding how to access your modules, and how to submit them on completion. Look under the ‘Custom Curriculum’ tab for your assigned learning modules. The practice questions in USMLE-Easy will help you test your knowledge with USMLE-style questions while preparing for the USMLE Step 1, 2, and 3. In order to take full advantage of the test bank you must login via the UMHS institutional interface with your personal login that was created for you (an email was previously sent regarding your logins). If you have trouble accessing please contact the Library. Next I would like to draw your attention to the various internet resource 'Kits', in particular the Medical Kit , and each of the semester specific 'kits', such as the Med5 Kit . I hope you will find some of these recommended websites useful. Please send me feedback and site suggestions so I can continue to improve the 'Kits'. Finally, the four column section along the bottom is a gathering of links to in-house resources that you will probably need to access frequently, such as our social media sites, ExamSoft exam portal, etc. Remember to regularly check this blog, the Anne Ross Library Blog, and The UMHS Endeavour Blog for interesting news posts and access to a wealth of information pertaining to medical resources and educational programs. In this bottom section you will also find links to your Webmail and to the CAMS Student Portal, etc. CAMS is where you will find your courses, your attendance record, and some of your grades. Most of your grades are found in your ExamSoft account, but at least your final course grade, will be posted for your confidential viewing in CAMS. Your CAMS login is provided for you by the IT department. 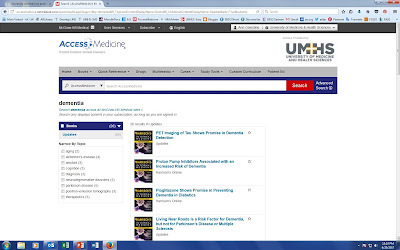 Keep up to date on UMHS Research happenings on the UMHS Research Wiki and be aware of upcoming medical conferences, calls for papers, etc. on the Research Committee’s Pinterest Board. Notice the link to the UMHS Exam Portal right there are well. This is the link to our computer based testing program ExamSoft. This program is what all of you are using for exam taking and where most of your professors release your scores on quizzes and exams. Now you can follow the Library on Twitter and Pinterest! As you go forward in your career, stay up-to-date on new resource developments by checking the Library Blog, the Library Twitter feed, and the Library Pinterest boards. Further descriptions of the library's resources, links to them, and instructions on how to navigate them, are available via the Library Blog and the Library website, particularly in the section 'Navigation Guides' on the 'Medical Kit'. I hope you all found this library resource tour valuable. Let me know if you need further help accessing and searching any of these resources. Each resource also has HELP links – so have fun and play around with trying different searches and different resources! Remember to stay informed by reading the blogs and subscribing to our Twitter feed and Pinterest boards. Please don’t hesitate to drop by the library or phone, email or Skype us, Linda, Doya, Jezelle, Raeeza, or Ann , for further assistance with accessing any information resources. Your suggestions are always welcome. Have a great semester! 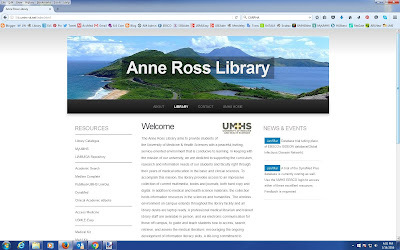 The Anne Ross Library Website Just Got a Makeover! The Anne Ross Library at University of Medicine & Health Sciences has a new look! Check out the new library website that connects UMHS students and faculty to all our great library resources, subscription databases, ebook collections, educational programs, as well as toolkits of links to key internet resources. A big thanks goes out to Dr. Peter Lee, UMHS Professor of Behavioral Science, for all his technical expertise, assistance, and patience during this project!! Post a comment and let us know what you think. The Anne Ross Library is pleased to announce the addition of eBook collections from EBSCOHost, providing hundreds of thousands of titles, available across all major academic subject areas. Users can access the full text of eBooks from their computer, or can download titles to most popular portable devices. This collection contains a large selection of multidisciplinary eBook titles representing a broad range of academic subject matter. The breadth of information contained here will support our faculty and student body with access to information relevant to their studies, research and life-long learning. There are more than 140,000 eBooks in this package, including titles from leading university presses such as Oxford University Press, MIT Press, State University of New York Press, Cambridge University Press, University of California Press, McGill-Queen's University Press, Harvard University Press and many others. Additional academic publishers include Elsevier, Ashgate, Taylor & Francis, Sage, and Wiley. Additional publishers highlighted in this package include Wiley, Oxford, Sage, World Scientific, Demos, American Academy of Oral Medicine, and many others. View a video on "How to Search for an eBook ". All titles in these collections are available with unlimited user access, and new titles are regularly added to the collection. DynaMed Mobile App from EBSCO on Vimeo. The DynaMed Mobile App comes with our UMHS subscription giving you access to all of the content on your iPhone, iPad or Android device. Download the complete DynaMed content set and you will receive notifications to update the content periodically. Download the free DynaMed App from the iTunes Store or Google Play. Log in to DynaMed from the Library Home Page. Click on the DynaMed mobile access link from DynaMed and enter your email address. The link will be located at the top toolbar. An authentication key will be emailed to you. Open the DynaMed email from your device. Within 48 hours, tap on the link in the email to authenticate the app. Note: after 48 hours, users will need to request a new authentication key. Your device is ready to go!